Glass Eye Studio Pillars of Creation. Translucent pillars of glass and cosmic dust are represented here using bright amber glass accented with dichroic glass flake sand topped by a cloud of dichroic dust. Approx. 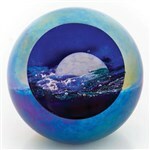 3" dia.The deep purple backdrop creates the perfect environment for this celestial wonder. Presented in velvet box with story card, signed and dated. Handmade in the USA .Each item is uniquely hand crafted and will vary slightly from the picture. "Pillars of Creation" is a photograph taken by the Hubble Space Telescope on April 1, 1995 of elephant trunks of interstellar gas and dust in the Eagle Nebula, some 7,000 light years from Earth. They are so named because the gas and dust are in the process of creating new stars, while also being eroded by the light from nearby stars that have recently formed. The appearance of the cloud suggests the supernova would have erupted 6000 years ago. Given the distance of roughly 7000 light years to the Pillars of Creation, this would mean that they have actually already been destroyed, but because light travels at a finite speed, this destruction should be visible on Earth in about 1000 years.